Alex Jones isn’t welcome at Google’s headquarters, according to a new lawsuit. Former Google engineer James Damore filed a class action lawsuitagainst the tech giant on Monday, saying the company discriminates against white male conservatives. That discrimination, according to the legal filing, impacts both employees and prominent right-wing voices that might visit Google. In a subsection titled, “Google Maintains Secret Blacklists of Conservative Authors,” the lawsuit says conservative blogger Curtis Yarvin set off a “silent alarm” when he visited an employee at Google’s Silicon Valley office in 2016. 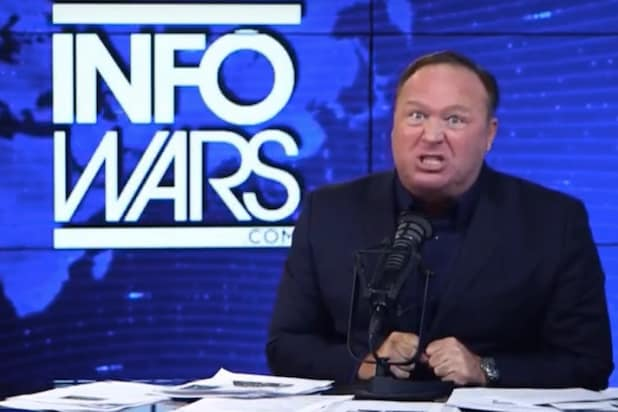 (The lawsuit includes an internal email telling security to “please follow protocols based on the prescribed actions of this type of guest.”) The lawsuit says Infowars founder Alex Jones — known for widely disputed opinions like that the Sept. 11 terror attacks were an “inside job” — and alt-right scribe Theodore Beale, aka Vox Day, are on the blacklist. In Sept. 2016, an employee asked Google’s Human Resources department if the writers could be stricken from the no-access group, according to the lawsuit. “HR refused to help with the request, and instead, reconfigured the internal system so that it was no longer possible to see who was on the blacklist,” said the lawsuit. “We look forward to defending against Mr. Damore’s lawsuit in court,” a Google spokesperson told TheWrap. Damore was fired by the company in August after an internal memo of his, calling Google an “ideological echo chamber,” was widely circulated. In the memo, Damore argued the chasm between male and female engineers was due to women being biologically less inclined, on average, to pursue tech jobs than men. “Differences in distributions of traits between men and women may in part explain why we don’t have 50 percent representation of women in tech and leadership,” said Damore in his memo. In August, Google chief executive Sundar Pichai said Damore peddled “harmful gender stereotypes in our workplace,” and was fired for violating the company’s code of conduct. Also Read:What's the Cure for Ailing Mashable, BuzzFeed and Other Online News Sites? The lawsuit, filed by Dhillon Law Group, says the filing is on behalf of any Google employees who feels they’ve been targeted for their “perceived conservative political views by Google,” as well as “their male gender.” Damore says in the document that after his memo went public, he was subjected to “multiple threats and insults from coworkers.” He also says his peers were given bonuses for touting political views in-line with Google’s. You can check out the full 161-page lawsuit here (the Alex Jones reference is on page 37).